The occupying military of genocidal Sri Lanka has deployed armoured vehicles at the entrance to the University of Jaffna since Tuesday evening when the university administration was forced to announce that the university has been shut down from 25th of November till 01st of December. The US-trained commander of the SL military in Jaffna, Major General Udaya Perera was insistent on closing down the university during the Tamil Eelam Heroes Day, informed sources said. Students were forced to abstain from attending the classes following the harassments caused by the SL military deployment. Finally, the SL military instructed the university administration to shut down the education activities citing low attendance of the students at the faculties of Arts and Science. SL military personnel present at the entrance with armoured vehicles have not been allowing anyone except the security guards to enter the university since Tuesday evening. Most of the students at the hostels have been asked to leave. 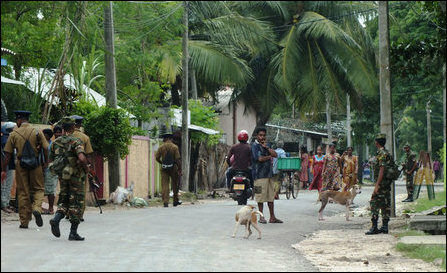 Already, students from districts outside Jaffna had left the hostel following the harassment by the SL military. In a statement issued on Tuesday, S. Thaceenthan, the president of the Jaffna University Student Union (JUSU) and S. Sayanthan, the secretary of the JUSU, have condemned the military deployment and the shut down of the Jaffna University. Amidst the prevailing harassments, the students had put up posters paying their tribute to Tamil Heroes inside the university premises last week. 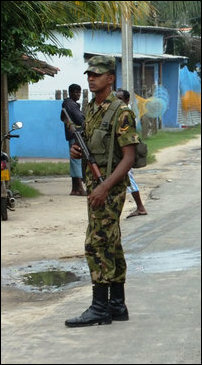 On Wednesday, SL soldiers were deployed in large numbers on the streets of Jaffna. The military has also stepped up its patrol and presence at the temples, schools and key junctions disturbing the normalcy. Sinhala soldiers were harassing bakery-owners in Jaffna asking them to inform if anyone were ordering cakes on the occasion of LTTE leader Pirapaharan’s 60th birthday on Wednesday. At Valveddith-thu'rai, SL military was deployed at the site where Mr Pirapaharan’s house was situated earlier. The house was completely demolished by the SL military in August 2011. At Nedun-theevu, SL military was removing Kaarthikaip-poo flowers, which were placed at several locations on Tuesday. The LTTE had declared Kaarthikaip-poo (Gloriosa Lily) as Tamil Eelam National Flower in 2004. In the meantime, Tamil National Alliance (TNA) parliamentarian S. Sritharan from Ki'linochchi has condemned the SL military for harassments against Tamils remembering thousands of their heroes who had laid down their lives. Sritharan was reacting to Sri Lankan Senior Police Superintendent W.P. Wimalasena, who said at a press conference in Jaffna on Tuesday that there was no such day as “Tamil Eelam Heroes Day”. Mr Wimalasena openly claimed that the SL police would act against anyone who attempted to mark Tamil Heroes Day.